It came out of a very old Catholic church. It’s not so much a wall plaque; this old plaster piece was built into the alter or wall of a church — as evidenced by the carved and gilded wooden frame. A rather large architectural plaster relief religious medallion. 23 inches by 27 inches, and 5 inches deep. 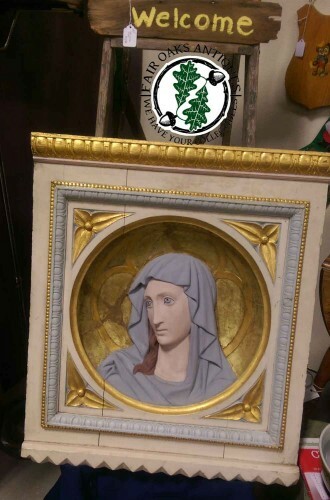 We are proud to present another turn of the church piece — a true antique religious item! Never seen another like it!